The Elite Sports Seat designed by Exmoor Trim is a superb all rounder of a seat. Designed with a classic sports styling to give you the practicality of a Land Rover and the comfort levels of a Range Rover. Designed specifically to fit directly into a Land Rover with the same four bolt fittings as your existing Defender seating, the design cleverly utilises the original Defender seat frame ensuring correct fitting and posture with the practicality of everyday use. You are also positioned directly in line with the steering wheel (unlike other sports seats modified to fit a Defender whereby you are positioned at an angle to the steering wheel) and no mounting brackets are required for these seats. The seat bases are easily removable in exactly the same way as your original factory-fitted front seats by simply releasing the base unit from the frames and runner mounts, giving clear and easy access to any under-seat storage that may be required for battery, fuse or storage access. The Elite Sports Seat is only sold in pairs and all advertised prices are for two seats: one left hand and one right hand. 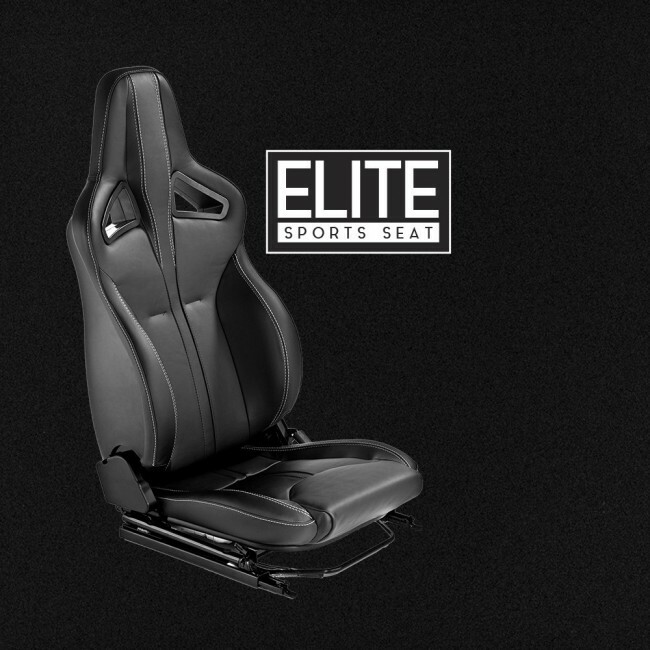 All our Elite Sports are fitted with seat heaters in the seat backs and bases in both seats. The seat heater kits include a wiring loom and switches allowing for a great upgrade for anyone wanting the benefit of warmth in the winter months. If your Land Rover already has OEM factory-fitted seat heaters we can supply a simple adaptor cable that will plug the Elite Sports seat heaters directly into your existing heating system without the need to alter any wiring configuration. These adaptor cables are supplied free of charge so just mention that you have OEM heaters at the time of your order. Or, if you prefer, we have specific OEM compatible heater pads that can be fitted on request at the time of production, for a small additional cost. 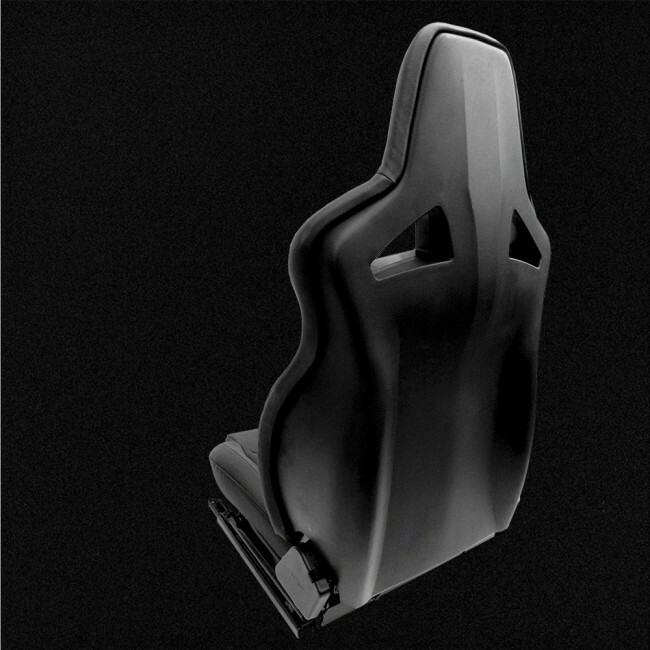 Although the design of the seat back is extremely comfortable, we have still included the addition of adjustable lumbar supports in the driver and the passenger seats as these are a handy little addition for that comfort fine tuning. The seat bases are extended to give superior leg support, with strengthened side bolsters to aid the wear and tear of getting in and out of the Defender. The bases have a sleek design, rather than a high-sided bolster, and with clever and subtle shaping we have created a high level of hold and support in the base. The seat back is higher than the average Defender seat giving much needed support. 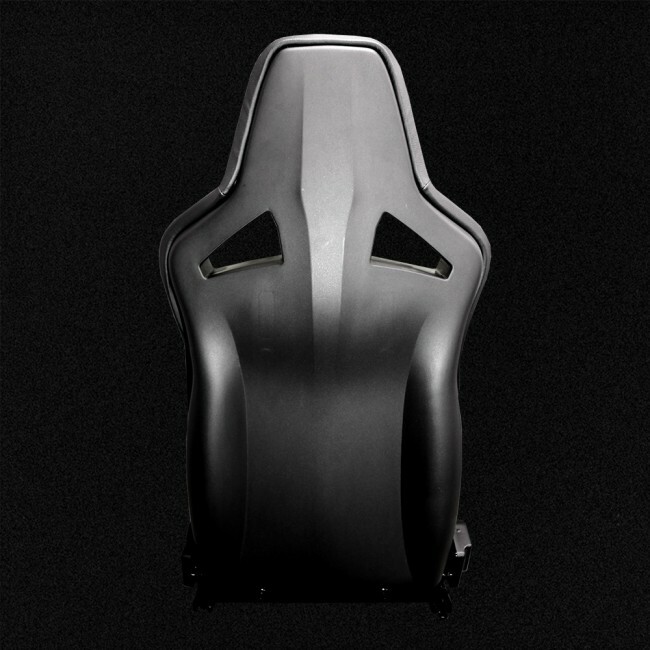 We have spent many man hours developing the final seat shape which offers the best hold and support in the lower body, whilst allowing the upper body to be free to move which is so important. 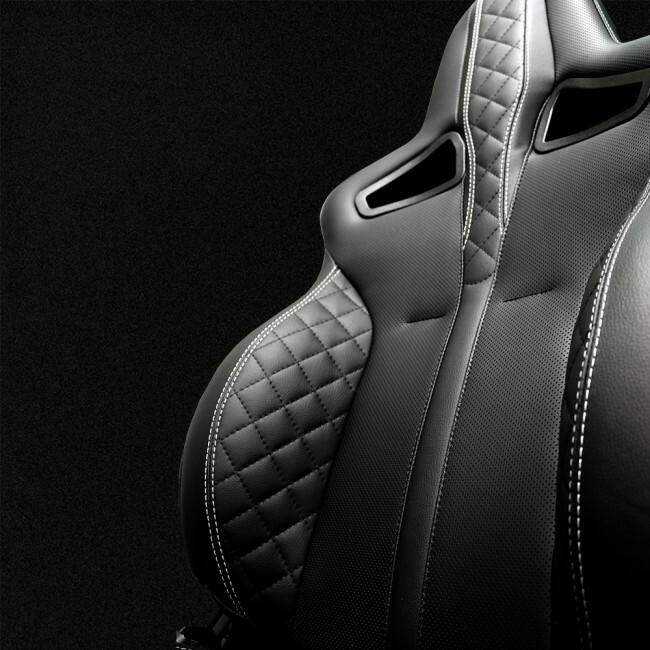 The seat back also has two harness apertures for style and also practicality for use with a harness-type belt.The seat back panel itself is made from a robust one piece ABS moulding which has a high level of strength whilst being flexible and gives with movement, supporting your body and weight equally over the seat loading. We have also now included finished trim covers for the tilting mechanism on the outer side of the seat frame and also on the inner side with a tidy cover to finish off. 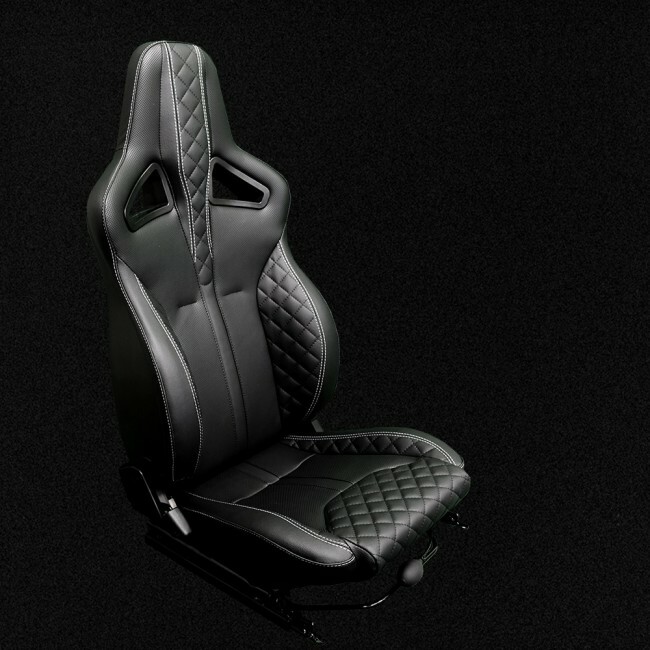 The Elite Sports Seat is available in a wide range of trim options from the drop down menu beside the main image, or you can choose any trim option or style you like from our “Signature” range which offers the individual a fully tailored bespoke service. 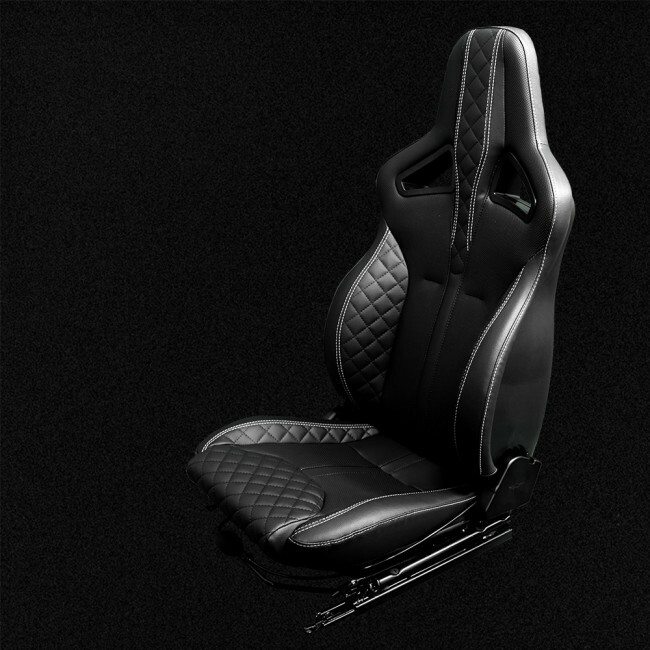 We are also able to send you computer-generated images of the seats in your own design to see what they could look like before we manufacture them, giving a clear view of what we would like to make for you. We also have a great new Fitting Centre where you can bring your vehicle in for a complete interior upgrade. So why not call in and discuss with our in-house experts exactly what you would like, or perhaps we could inspire you with some fresh ideas and you can try out the seats in our showroom. 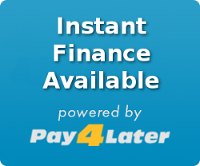 APPROVED by the Vehicle Certification Agency (VCA). Impact tested (Millbrook Testing Ground). Approved worldwide and certification supplied with every seat.